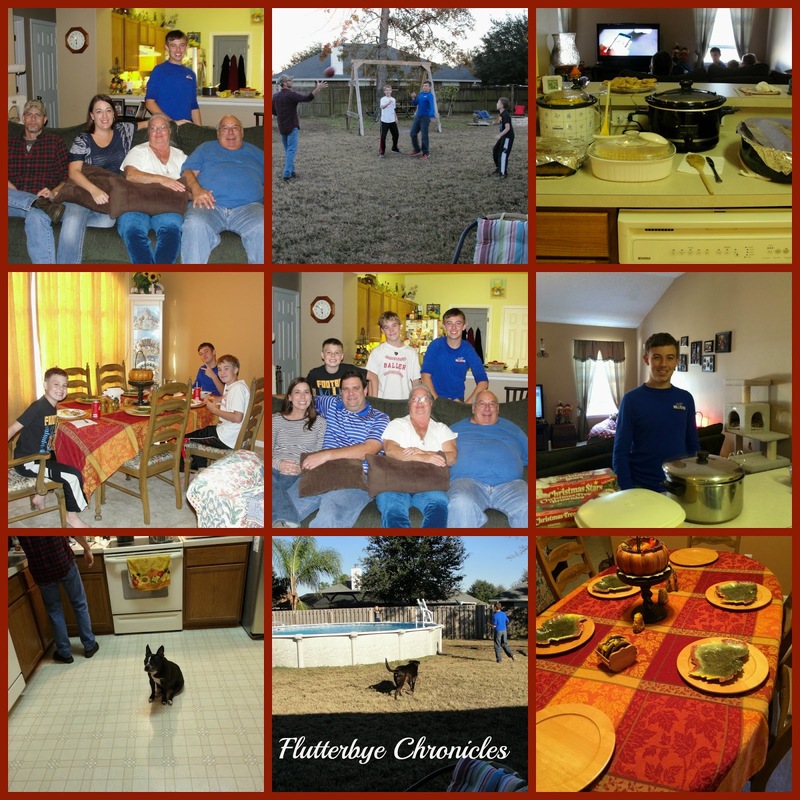 We had a great day full of family, food and fun. I have been wanting to make this Caramel Apple Pie Cookie recipe for a while so since it is Thanksgiving tomorrow I figured no better time like the present. I used two websites as my guide. Tablespoon and Oh Bite It. Both websites have great step by step instructions for this recipe. 1 Can Apple Pie filling or you could make your own filling. Preheat oven to 350 degrees. You might want to go ahead and grease two pans because someone didn’t and had to scramble to do it with sticky hands covered in apple pie filling and dough. Sprinkle clean surface with flour and roll out dough just a little . Then spread some caramel sauce on one of the pie crusts all the way to the edges. Then chop up about a 1/2 can of apple pie filling. You want it pretty well chopped so it will spread easy. Spread that all the way to the edges as well. Then with your other pie crust cut into even strips about 1/2 inch wide and make a lattice top on top of the filling. Don’t laugh at me I did not cut mine even. Next you will use a 3” cookie cutter and will cut out your cookies. You should get about 10. I think I did pretty good for my first try. Even the wonky ones turned out pretty. Ignore my pan it’s old! Happy Day Before Thanksgiving Everyone!! I had been putting it off but it needed to be done. She had this cool little doo dad to clean hers called a brush egg, but I didn’t have a cool doo dad so I just did the Jenny version and used the back of my shower brush thing since it has little nodules on the back. Keeping it classy folks ! I just mix a little Dr. Bronners Tea Tree Soap with warm water in my cup and dip my brushes in my cup and swirl them around. I then sweep them over the back of the shower brush while running them under water to get all the makeup off. Once the water runs clear then they are clean. At this point I started getting very uninspired and I still had more.. Why do I have sooo many brushes!!!! But I carried on and got them all done. I think I might need to look into getting a egg thing!! I also got a new shower cleanser from 100% pure. I did not know they sell this brand at Ulta now and you can use your coupon cause it’s not considered prestige! This stuff smells so good. It smells like vanilla obviously but it smells like a vanilla taffy or some kind of vanilla confection from my childhood. I literally try to pinpoint the exact scent every time I am in the shower now. Anyway I love it and I love this brand! This has nothing to do with beauty or makeup but look how cute this change purse is I got on clearance at Pier One! They had a bunch of different styles which would be perfect for girls for Christmas! It contained a City Color Be Matte lipstick in the shade Cappuccino, Jesse’s Girl eye shadow in the shade Rosemary Frost, Skyn Iceland glacial cleansing cloths, Ecru New York acacia protein bb cream for the hair and a Figs & Rouge mango mandarin hand cream. The only thing I was not thoroughly impressed with was the hand cream other then that I really like the rest of the products from the October bag. This months theme was Girl Meets Glitter! I redeemed some of my ipsy points for a Chella ivory lace highlighter crayon. I received one in a ipsy bag a while back and absolutely loved it so when I saw that we could redeem some points for one I jumped on it. My first actual product in my bag was this Marc Anthony oil of Morocco argan oil hairspray. Say that ten times fast!! I really like the smell and feel of this product. It has good hold without that crunchy feeling if ya know what I mean. A full size retails for $8.99 at Ulta. Next item was the Temptu s/b highlighter in pink pearl. This is a very pretty but subtle highlight for the the cheeks or on the brow bone and you can also use it mixed in foundation for a luminous effect. A full size retails for $27.50. I also received a waterproof liquid eyeliner from Elizabeth Mott in the color glitterati. This is a deep black liquid eyeliner with a little bit of shimmer. It is very pretty and very waterproof. My hand was red after trying to get this off with soap and then eye makeup remover. I also received a eye shadow base from Be A Bombshell in the color submissive. This is probably my favorite item in the bag. It is soo pretty for fall and so creamy it just glides on. I seriously love it. Last but not least is a wonder lip paint from Jcat beauty in the color red potion. This stuff is comparable to a OCC lip tar and is very pigmented so a tiny bit goes a long way. I had to sheer it out cause it was so dark, but it is beautiful. A full size retails for $4.99. ← you can’t beat that a OCC lip tar is $18.00 at sephora! Here is my look with everything on but the liquid eyeliner. I saw this palette on Youngwildandpolished’s instagram the other day and then again on her youtube channel and she raved about the quality so when I was at Tarjay yesterday I picked it up. It is a $10.00 palette and the colors are just perfect for fall. Soo pretty and so pigmented!! So if you see them at your local Target I would definitely pick them up or right now they are BOGO on the ELF site with the code STAFFPICKS but the sale ends today so hurry over if your interested. I only have this one but the smoke palette looks nice to.